No need to buy both an anchor spreader and an anchor squeezer for your tie gang. Simply swap the workhead tools, in the field or shop, to switch between spreading and squeezing functions. (total capacity = 8) to ride in the cab. Fewer personnel carriers mean less equipment to maintain and less space needed on sidings for overnight storage. Simply change a workhead tool to switch between tie mode and no-tie mode. Since the AA2R also loosens and pushes the tie plates during the adjusting function, your crew has to perform less manual labor to remove embedded plates from badly degraded ties. acquisition costs, maintenance costs, and even storage costs -lowering your overall total cost of ownership. 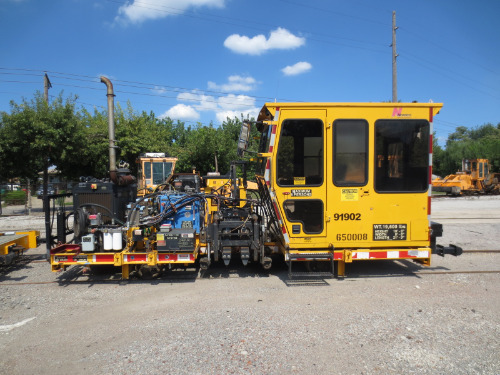 In addition, the AA2R uses many of the same components as other Nordco machines, so you can stock fewer maintenance parts on your parts wagon. Payment is due within 3 days of SALE unless other arrangements have been made or if payment is due upon you picking the item up. Please contact us if you have any questions. Please use checkout to pay for this item online unless you have made other arrangements with us prior to the end of sale. All sales are final All sales of large or freight items is final at all times. We cannot and do not refund any shipping fees on any auction item. All shipping costs are the responsibility of the buyer. If you have any questions you are welcome to call Troy at 970-466-2886. If no anwer you can call our main lot at 970-522-6991.